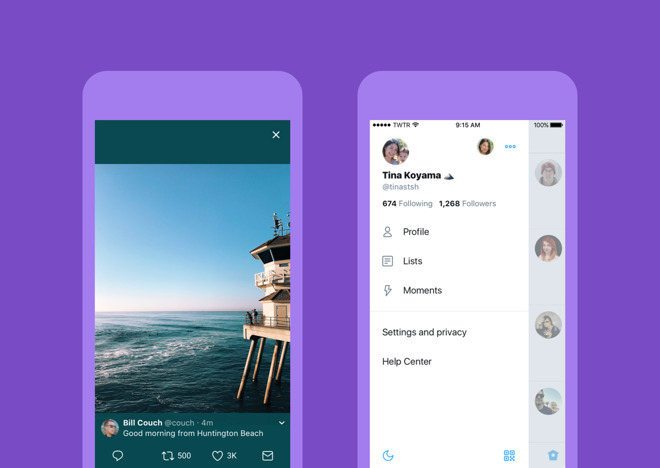 The updated app offers "bolder headlines and rounded designs," according to Twitter, plus a new side navigation menu with access to a user's profile, accounts, and settings. Tweets make use of new icons and will automatically refresh their like, reply, and retweet counts. For all users, the new app opens websites in Safari's in-app viewer. This includes access to Reader mode, and should also make it easier to access Twitter accounts a person has signed into. Accessibility options have meanwhile been moved into a more visible space, and expanded to include things like higher color contrast and opening links in Reader View. Lastly, profile photos can be customized with filters and stickers, mirroring options at rivals like Facebook and Snapchat. The Twitter app is a free download and runs on any device with iOS 9 or later. Twitter has been struggling to grow its userbase and turn a profit, faced with intense competition from other social networks. The company has gained some attention thanks to its most famous user —U.S. President Donald Trump —and is branching into live video.